We are verry happy to offer Malas in our collections as well now. For a while now we have been looking for the possibilities in doing so and finding the right partner. We are convinced to have found that partner in Manipura Mala. Tati is the creative force behind Manipura Mala. All malas are designed by her to match Liquido’s yoga clothes. These malas are exclusively designed for Liquido Fashion. Tati is a true mala whisperer. She makes the malas with conviction and intent. For each mala she really takes her time. Every mala is made with the attention and respect it deserves. The malas are made to match a certain pattern legging, but of course you can also order them separately and/or combine them with different pieces of our yoga clothes. A mala can also be a great addition in daily life and protect and strengthen you. 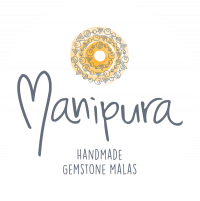 Manipura Mala: “Since 2015 we hand-make gorgeous, meaningful and powerful Gemstone Malas, where quality and intention blend with remarkable gemstones to tell unique stories. Our malas are designed to empower people to discover, love, and shine their true colors. We learn all the time about the special powers of stones and crystals and make beautiful and powerful combinations to inspire and support you on your path. We are absolutely in love with what we do and believe that wearing the right Gemstone mala can spark a deep and positive change in people’s lives. We believe in the power of Earth’s stones to support our body and mind, while helping us manifest our heart’s wishes. Malas have been traditionally called ‘prayer beads’ and they could be found in different spiritual traditions that have any sort of meditation practice. Japa Mala for instance is an ancient Hindu practice of repetition of a mantra as a form of meditation. During meditation, the mala helps concentration with the simple sensation of the beads passing through the fingertips. Malas can found in all facets of religions and cultures throughout history, such as Buddhism, Sufism and others. These beautiful ancient tools support your spiritual practice as powerful close reminders that bring you back to the present moment. Furthermore, Malas are also believed to shield the wearer from negativity, and regular meditation can even increase their power at that. While the original malas were made out of various seeds and were therefor mostly similar to each other, over time, more and more malas have been created out of crystals and minerals. In this way, it was possible to harness the powerful properties of Earth’s stones into a more complex and unique purpose that could be tailored to the specific needs of the wearer. As we learn more and more about the healing properties and energies of stones, we are able to create malas that are personal, meaningful, inspirational, and in the same time beautiful.